Fig. 3. In vitro RNA-protein binding assay. RNA-protein gel shift assay of [32P]UTP-labeled 177-nucleotide Topo II3' UTR riboprobe. Radiolabeled riboprobe (1 x 105 cpm) was incubated with (lane 2) or without (lane 1) 15 fig of protein extract prepared from asynchronously growing HeLa cells. For competition experiments, the protein extract was first incubated for 10 min at 25° with unlabeled specific [177-nucleotide Topo II 3' UTR, lane 3 (0.1 ng) and lane 4 (10 ng)], or nonspecific (10 ng of /¡-galactosidase, lane 5), competitor RNA before the addition of the radiolabeled transcript. 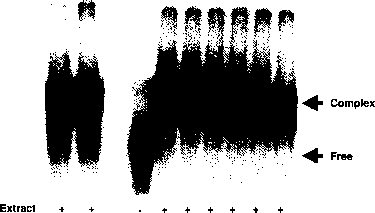 Comp., Unlabeled competitor transcript; NS, nonspecific /¡-galactosidase transcript. Arrows represent mobility of the free and protein-bound riboprobes. in mobility is due to an RNA-protein interaction, because proteinase K treatment of cellular extracts before the binding assay abolishes the retardation (data not shown). The specificity of the RNA-protein complex is determined by performing competition experiments in the presence of unlabeled 177-nt Topo II 3' UTR-specific competitor or nonspecific competitor RNA (/5-galactosidase). Whereas addition of 0.1 ng (Fig. 3, lane 3) of unlabeled specific competitor has a minimal effect on protein binding, 10 ng (Fig. 3, lane 4) of the unlabeled transcript competes completely with the radiolabeled 177-nt Topo II3' UTR RNA for protein binding. In contrast, 10 ng of the unlabeled nonspecific competitor RNA (/3-galactosidase) does not compete with the radiolabeled transcript for protein binding (Fig. 3, lane 5). 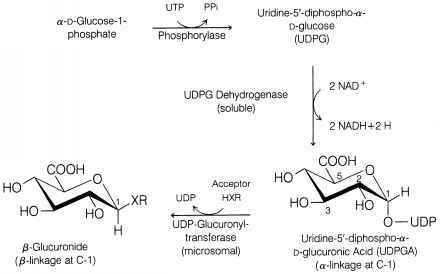 In control reactions without the protein extract (Fig. 3, lane 1), the radioactive bands above and below the complex could be due to RNase T1-resistant secondary structures of the transcript. These results show that protein binding to the 177-nt Topo II 3' UTR transcript is specific and demonstrate the applicability of the in vitro RNA-protein binding assay. The redox sensitivity of protein binding to the 177-nt Topo II3' UTR is assayed by slight modifications of the method described above. Protein extract is prepared from asynchronously growing HeLa cells, using extraction buffer that lacks the reducing agent DTT. Similarly, DTT is omitted from the binding reaction buffer. Subsequently, binding reactions are performed in the presence of 2 mM DTT. The reaction mixture containing the protein extract is incubated with DTT for 10 min at 25° before the addition of the 177-nt riboprobe. The binding reaction is continued for 20 min after the addition of radiolabeled transcript and is analyzed by RNA gel shift assay as described above. Binding of cellular proteins to the Topo II 3' UTR increases 3- to 4-fold in protein extracts pretreated with the reducing agent DTT (compare lane 2 with lane 1 in Fig. 4). The assay is then repeated in extracts supplemented with 2 mM DTT and increasing concentrations of a thiol-oxidizing agent (diamide). A dose-dependent inhibition of protein binding is observed in extracts pretreated with the sulfhydryl-oxidizing agent diamide (0.1,0.5, 1, 5, and 10 mM\ Fig. 4, lanes 5-9). Whereas 0.1 mM diamide does not cause any significant change in protein binding (Fig. 4, lane 5), 0.5 and 1 mM diamide cause 30 and 50% decreases in protein binding (Fig. 4, lanes 6 and 7). Increasing the diamide concentration to 5 mM (Fig. 4, lane 8) and 10 mM (Fig. 4, lane 9) further inhibits RNA-protein complex formation. Taken together, these results indicate that reduced thiol residues in Topo II3' UTR-binding proteins participate in the RNA-protein complex formation and that oxidation of these thiol residues to the disulfide form abolishes binding. These results show that the RNA-protein binding assay described here can be applied in vitro to determine the redox sensitivity of proteins binding to the 3' UTRs of cell cycle genes.